This option is designed to make it easier for you to integrate any web, application, or database servers that you created in GCP with itopia CAS so you can use the itopia management portal for all your GCP servers. The servers are imported as standalone app servers, they are not added to the existing domain in the deployment. The instances you want to import must be in the same project that is associated with your deployment. If you want to import a custom image, you will have to make the VM instance from a snapshot of that image. Click the name of the instance that you want to assign an external IP to. Click the Edit button at the top of the instances page. Look under External IP, you will probably see an ephemeral IP (dynamic) - select static external IP address to assign to the instance. Select the deployment you will be importing the servers to. When you hover your mouse over the green + sign on the right, you'll get the option to import servers. Note: If you don't see any servers listed, make sure the servers are located in the same project as the project connected to your deployment. Select the server that will be imported and click Import button. The process will start and import the servers to your itopia deployment. Once done, you can manage them from itopia CAS. 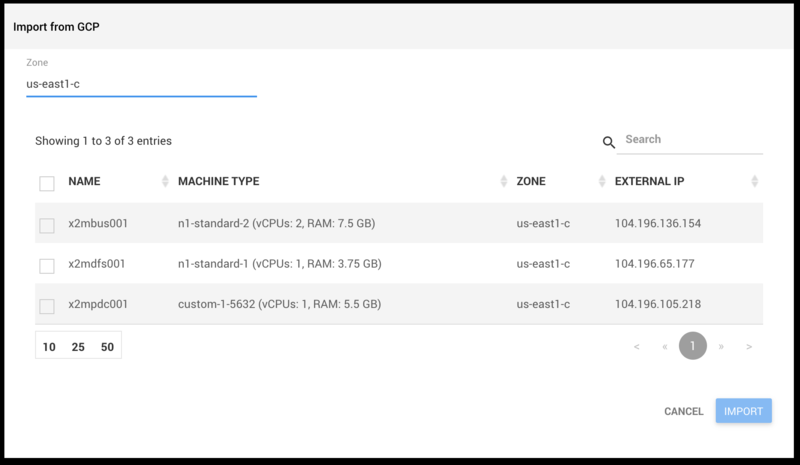 Connect your GCP account, select your GCP project and a Region where your other servers will be located. Make sure to click on the green plus sign on the right from the region selection drop down. If importing a VM instance that was created from a snapshot, under OS you'll have a drop down menu where you'll have to select the OS that this vm is based on. 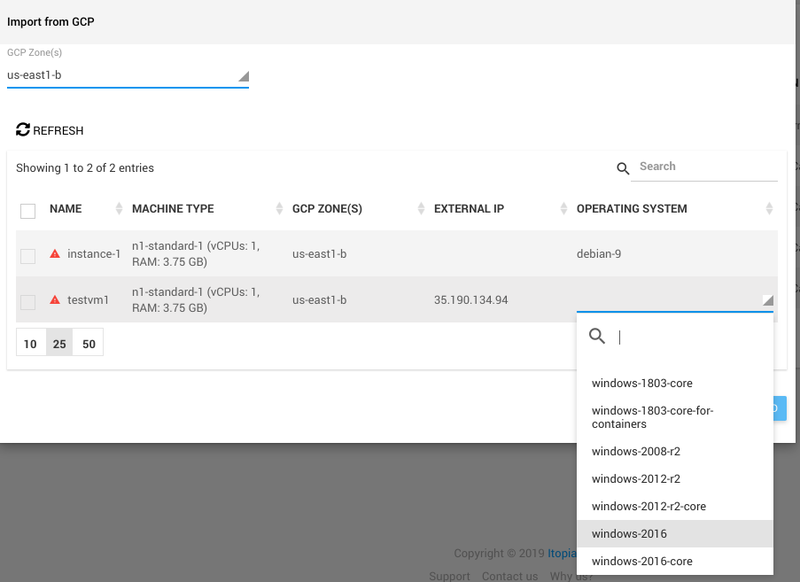 The list only has the OS versions that google currently provides, so if it isn't on the list, and you choose one you believe should be similar ( such as the vm being Server 2012, but you choose Server 2012 R2 from the list) we can't guarantee there won't be any issues with the performance of our management commands on the vm. Continue with the rest of the deployment process normally. The system takes a snapshot of the instance and saves it in the Google Console as a security measure before the import process starts. Firewall rules are created in GCP to allow itopia CAS to access the server. Local admin accounts are created and sent to the admin's email address.